How is RonShandler.com related to BaseballHQ.com? It’s not. This is my new home. My old home, BaseballHQ.com, remains a comprehensive baseball analysis source with daily updates and interactive tools, staffed by dozens of writers and analysts. RonShandler.com is just me, with a focus on new approaches to playing fantasy, commentary and opinion. BHQ has its own culture that has evolved over decades. Think of RonShandler.com as “and now for something completely different.” So if you were looking for a reboot of Baseball HQ, you won’t find it here. What does membership to RonShandler.com buy me? 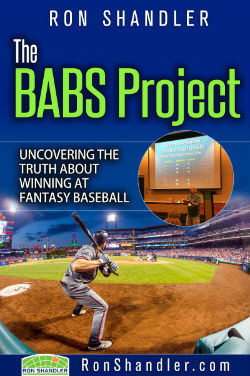 It starts with a free copy of “The BABS Project,” a 100-page PDF publication that describes the concept of the Broad Assessment Balance Sheet (BABS), which drives the fantasy content on the site. Membership then gives you access to downloadable data files, the BABS player database, cheat sheets, message board, analyses and more for the upcoming season. Nearly all of the pre-season articles and many of the in-season articles are written by me, a mix of actionable roster management advice sprinkled with occasional light feature pieces. Membership gives you access for 12 months from the point you join, with most of the content concentrated during the baseball pre-season, and then scaled down through September. And you get all of this for less than the cost of parking at CitiField. There is a lot here. Where do I start? Best to start with perusing “The BABS Project” ebook. The reports and cheat sheets generated by the database and the master spreadsheet will look wrong to you without a basic understanding of how BABS works. Chapters 1 and 2 go into the philosophy of why we need BABS, then the rest of the book gets into the nuts and bolts. Yes, it will take a little time to get up to speed. Guaranteed it is worth the effort. Feel free to use the Member Forums to ask questions. I pop in pretty regularly there as well. 2-4 times weekly from mid-January through Opening Day, then 1-2 weekly during the rest of the baseball season. I would write more, but then I’d have to give up things like family contact and personal hygiene. I send out an email every Friday to all current members with updates, so if you only want to visit when there’s something new, you’ll be alerted to that. How do I sign up to become a member of RonShandler.com and have access to the book? Can I see some sample content? Sure. Check out our Free Goodies page. All memberships are processed through PayPal.com. You can maintain your payment information on that website.